Wings crippled by ice, a small plane battles to stay aloft in the skies over the Magdalen Islands. A lightning strike forces a white-knuckle landing on a small runway in the Sierra Nevada Mountains. Somewhere over the raging Atlantic Ocean, wet snow seizes an engine. As the Natural Sciences and Engineering Research Council (NSERC) Industrial Research Chair in Extreme Weather, Stewart wants to learn the “missing physics” behind catastrophic weather events that cause untold misfortune—even if it means taking planes into the heart of a raging storm. The “flying laboratory,” owned by the National Research Council, lets Stewart and his team customize their flight path as a storm evolves, enabling them to capture real-time temperature, wind, precipitation and moisture data that are simply unattainable from the ground. In addition to projects that will take him to Iqaluit in 2007 to examine changing weather patterns in Canada’s North, Stewart is working with the Institute for Catastrophic Loss Reduction (ICLR), a research centre spearheaded by Canadian property and casualty insurers, to study the physical mechanisms of winter precipitation. The reasoning is simple: increase understanding and you increase prediction accuracy. Increase prediction accuracy and you give people more warning to protect themselves and their property from harm. Decrease destruction and you decrease insurance pay-outs, a billion-dollar lesson the insurance industry learned all too well from the catastrophic ice storm that crippled parts of Eastern Canada in 1998. The kicker? Slight deviations in atmospheric temperature or moisture during that storm would have prevented all that freezing rain—and loss. The only thing worse than too much precipitation is not enough of it. Raised a Manitoba farm boy, Stewart calls the 1999–2005 prairie drought that caused billions in lost crop production and immeasurable psychological devastation “possibly the worst natural disaster Canada has ever had.” The phenomenon was particularly bewildering because there was almost as much moisture in the atmosphere as in less arid years—it just wasn’t making its way to the ground. As founder and co-leader of the new Drought Research Initiative network, he’s working with various agencies (including the Canadian Wildlife Service, Alberta Environment, Saskatchewan Watershed Authority and Manitoba Hydro) to unmask the physical features of that dry spell, and better understand drought mechanics in general. Last year, forecasters were calling for yet another parched summer—right up until floods ravaged southern Alberta. Improved predictions could allow farmers to plant drought-resistant crops (wheat, for example, instead of canola) and help hydro companies better manage their water resources. Mental-health experts also feel that understanding the meteorological reasons behind dry seasons might help families cope better with the emotional fallout of decimated livelihoods. 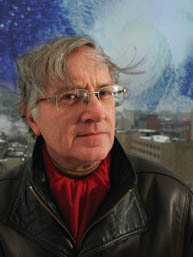 Ronald Stewart’s work is funded by NSERC, the Institute for Catastrophic Loss Reduction and Environment Canada.